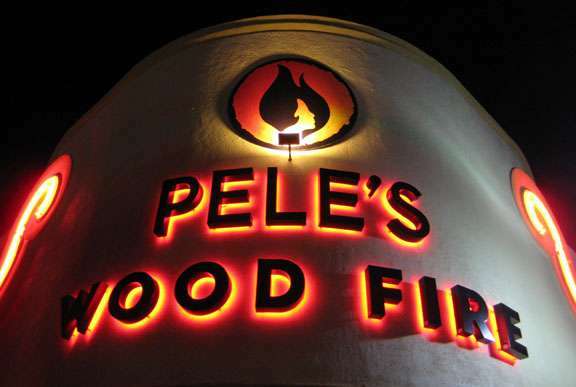 I usually don't try new places until a few months after they open, but I made an exception for Pele's Wood Fire in Riverside. The restaurant is located in the old Carters Park & King Pharmacy building. They have completely transformed the location into a very sleek looking restaurant, especially at night! We went on a Sunday night and the place was pretty busy. Luckily, we didn't have to wait and were seated right away. Pele's grand opening isn't for another couple of weeks (officially), so they have a limited, smaller menu available for the time being. One really neat thing about Pele's is their pizza ovens. They have two oak and hickory wood-fired ovens that are 1400 degrees and cook pizza in 90 seconds! After we placed our order, we were brought a basket of bread and some olive oil for dipping. The bread was a little well done, but it was still soft and fluffy. I really wanted to try the pizza, but I went with the Porcini Mushroom Risotto instead. I am going to be honest and say that I did not love this dish. I liked the actual risotto part, but the mushrooms didn't taste great and there was a ton of parmesan cheese in the middle (on the top). Ivan got the Prosciutto Di Parma pizza and once again, I had a serious case of plate envy! The pizza was a lot bigger than I thought it would be, but it was also very thin (I like that but Ivan does not). There were ample toppings and it tasted great (yes, I snagged a piece!) The only thing I would say is that the bottom had a little bit of "burnt" flavor from the oven, but it was not actually burnt. I haven never really had wood oven pizza before so maybe that's how it is supposed to be, I don't know. Either way, it was delicious! The verdict-Not sure. I liked the pizza but didn't love the risotto. The prices were also way out of proportion. I think it would be more appropriate if each entree was at least $5 cheaper.﻿ I can think of at least 5 other restaurants that are a better value for the money. I think it's a shame because the restaurant has great potential, but people are not going to come in when the prices are so high. With that being said, I might give it another shot after the grand opening. If I do, I will be sure to write a follow up post! Their Prosciutto Di Parma looks very delicious. Do they served gluten free dishes as well?